Another crappy picture, but then it’s tough to get good shots down in the little hole where I used to keep my active systems. This is a launch Xbox, a little bit worse for wear but if I cleaned it up a bit it’d look good as new. The hard drive in it screams like a banshee, and I’m sure if I’d kept using it long enough, it’d fail and take all of my game saves with it. I really hate the whole idea of having a hard drive in a game console, honestly – with the main audience for consoles being kids or young adults, you just know these things are going to be mistreated and PC hard drives are not known for their toughness. Couple that with the optical drives that are almost required in today’s systems and you’ve got a recipe for unreliability. Today’s systems are fragile to an unacceptable level with all these moving parts. I’d like to see a move to built-in solid state memory for game saves next time around, with the option to buy memory cards (same as now) if you ever run out. I say this is a launch system, but then what’s a Controller S doing on top of it? Well, I simply bought one, that’s all – the original canned ham controller is in my accessory drawer as viewed on my games/misc page. That’s also a Madcatz Microcon controller sitting on top of the system next to the Controller S – this is the controller my wife uses when she plays with me, as it’s even a little bit smaller than the Controller S. Almost too small for me, which is amazing for an Xbox controller (MS themselves were apparently pretty amused when they saw Madcatz demoing these things at E3 – they didn’t think it was possible to make a controller smaller than the S). The Microcons are pretty cool, though, for all systems – they feel solid and snappy, and are perfect for people with small hands. 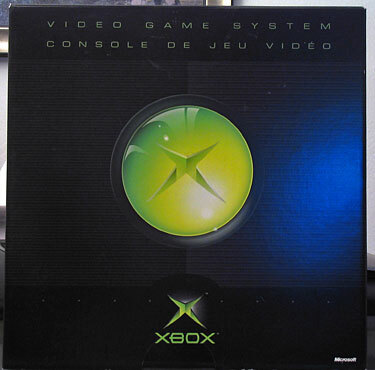 When MS first announced the Xbox I actually thought it was kind of cool to see an American company finally get back into the game console business – first American console manufacturer since Atari bowed out in what, 1992? And there really hadn’t been a serious American system since 1984, when Coleco, Mattel, and Atari all exited the market nearly simultaneously (temporarily, in Atari’s case… but they never returned to glory). So I was pretty stoked for the Xbox initially. I have to say that I was a bit disappointed with the system in reality, though. It is just a PlayStation 2 with slightly better graphics. People these days bicker over whether Xbox Live is better than Sony’s open network, or whatever, but honestly, in 15 years nobody will even remember that debate. 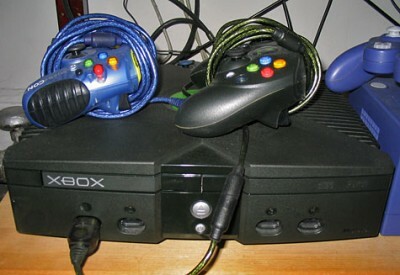 All they’ll remember is the games, and while the Xbox has some good ones, it doesn’t really have anything truly unique. It has also played its part in “dumbing down” the video game industry into a Hollywood-style hit- and sequel-driven business that is almost anti-innovation. All of the Xbox’s popular games are either sequels or they’re games in well-established genres that simply follow genre conventions. The reason that I have an Xbox is because if there is a multi-platform game, you can usually count on the Xbox version being the best. But I am completely indifferent to the system itself. I have to side with you, I never actually played the xbox, Because it just didn’t have any games that interested me. The only game I ever really played on it was Doom 3, and that was just to see how it was on the system, I own it for PC. And the Hollywood remark is spot on with most games nowadays (I feel that way about the PS3 and 360 too), And why I haven’t even really played any new games in the last 2 or 3 years. And the ones I HAVE played were PC, or Wii games.